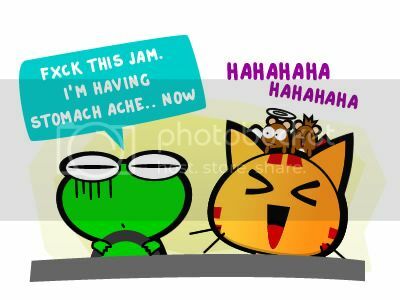 hahahahaha.. seriously, anyone ever got stuck in a jam and having stomach ache? 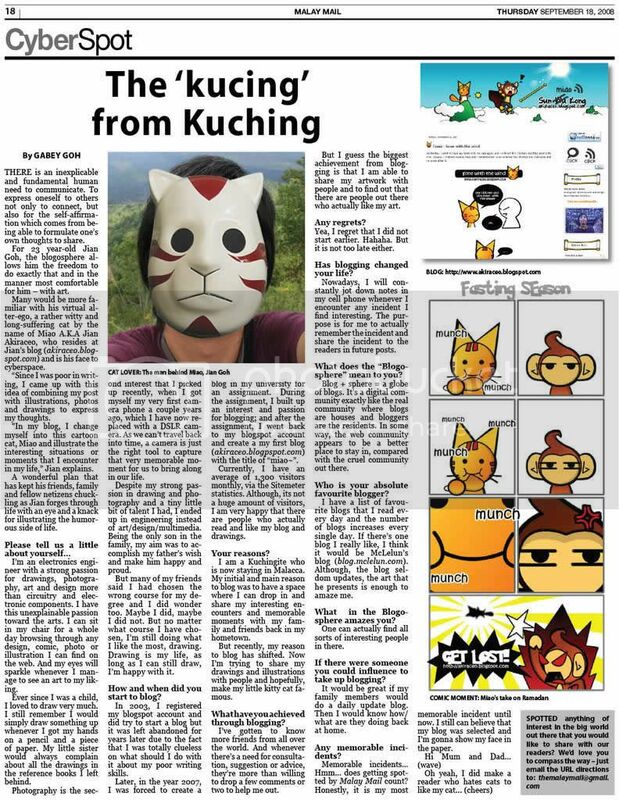 Posted on August 5, 2013 by Jian Akiraceo. 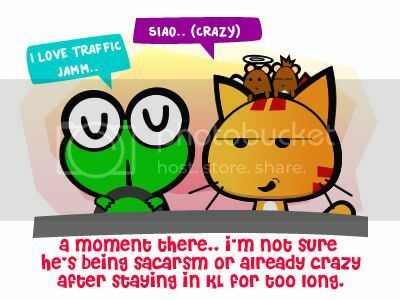 This entry was posted in Outdoor and tagged cartoon, comic, crazy, kl, miao, traffic jam, wafu pafu. Bookmark the permalink. Wa… Who in the world loves jam? I think froggy is trying to psycho himself to think that ‘Jam isn’t so bad after all. Relax relax….’. But in fact he’s pretty pissed with the traffic. Haha. really kan. i also cant tahan. my friend boleh jam to work then back home everyday swt..
lol! joel is such a cute frog! 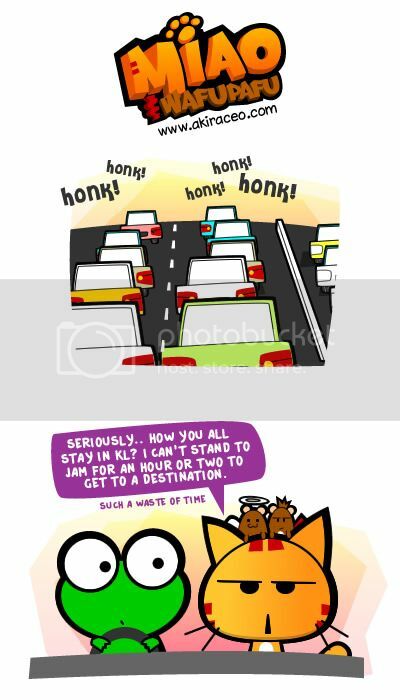 the same thing comes into my mind whenever i came to KL and got stuck in a traffic jam. one you can’t apply on breads. That 1 really gila max weii 9 hours of slow/static ride. That’s the reason I still on bike. ohhh Joel is a frog! LOL I remember the longest reported jam was 5hours++, there’s massive jam, rain & flood. So trapped at the highway. My friend was torn between thirsty + hungry + sleepy + want to pee. It was right after work on a Thursday evening, so right out of the cold office.. heading home for a warm dinner is a bliss, unfortunately it became a twilight zone nightmare. So what he did after 3hours, he drank some water, treasure hunt whatever food/candies in his car/bag. After that, his pipe were about to burst.. he recalled his aunt’s stories about holding on for too long will spoil the A-Z parts of the body. With the rain tht’s like “peeing from the sky like waterfall”… he almost wanted to get off the highway pee at a corner or just open the door slightly to pee to the road. He’s got this “hygiene” issue about peeing in the car & storing the pee in the car but was afraid get accident due to the heavy rain. His only water bottle is those “good 2-3 liter size” aka “not plastic bottle (in his own words”). The thought of peeing into it just disgust him, but his “life & death” were in his hands & pants at tht time.. so eventually even though the bottle is still 1/2 full.. he emptied it thru the window (coz. can’t drink anymore too full). Relieved dah, he felt stupid coz. he felt thirsty. Luckily for him, he use the rain water to wash his hand. LOL. He almost stuck his head outside for rainwater. So he told me moral of the story, always hv empty bottles in the car ( for gals lain ceritalah). LOL i tot alone in jam is more boring. no? Yes, no one would love traffic jam. It will ruin our life. By the time you reach home your child already sleep. No quality time for them. I definitely stay in KL so long until traffic jam = no big deal. hahaa! a big waste of time and fuel, right? I was stuck in a jam for hours from KL to Penang and I had to pee badly and the next toilet stop was 20km away. T^T Luckily I could still hold it. Terrible experience. I ever hold my pee before on a trip but it was not a jam. Still it was horrible. I can’t imagine holding and not knowing when can release them. One of the reason why I don’t like driving car in daily basis, especially go to work. i put novels in my hp and started reading it while stuck in jam. I think I finished most of my novels in car….